Thank you Fiewel & Friends for gifting me a copy, and Macmillan for inviting me on to the Blog Tour. This was best described as Ru-Pauls Drag Race, meets Oceans 8. I’d say that was accurate. I had fun reading this one. It was fun, silly, predictable, a little bit thriller, a little bit mystery, and a lot of creative storytelling. This is my first Caleb Roehrig book, and I can definitely see myself reading more. I love the teenage heist prose, and I LOVED that it was with a team of drag queens. The only bad that I can say is, it’s a bit lengthy, and I feel there was just some info that didn’t feel like it had a place in the book. But other than that, I loved all the twists, and turns that DPB’s offered up. The history of drag queens is an evolution from a common theater practice to an award-winning form of entertainment that has gained legitimacy both on a national and international stage. Drag as an art form has exploded largely thanks to the life and career of RuPaul Andre Charles — arguably the most famous drag queen in the world today. RuPaul’s current claim-to-fame is his tenure as the host and face of the reality TV show RuPaul’s Drag Race which has changed the history of drag. The competition reality show for drag queens first aired on the Logo TV network in 2009. Now nearly 10 years later, the show has a massive viewership that spans beyond the LGBTQ+ community and its allies, a number of spinoffs including RuPaul’s Drag Race Thailand and RuPaul’s Drag Race UK, as well as a 2018 Emmy Award for Outstanding Reality-Competition Program. RuPaul even won the Emmy for best host in 2018. With its mainstream success, some may be surprised to learn that the history of drag as a form of entertainment dates back to Shakespearean times and for more utilitarian purposes. Indeed, the history of drag seems to be one inextricably tied to the theater, and before the theater of Shakespeare’s time, the stage was used for religious purposes. Drag, then, has a bit of history in the religious world. But in the 17th century when Shakespeare’s plays were first performed at the Globe Theatre in London, only men were allowed to take part in the productions, as they were in religious rites. So when plays included female parts, the male actors would dress as women to fill the void. Wikimedia CommonsA depiction of a scene from King Lear, featuring performers dressed in drag. It’s in the theatre that the term “drag” is believed to have originated. When men played female parts, they would supposedly discuss how their costume dresses would “drag” across the floor. Vaudeville performance gained traction in the early 20th century in the United States, and it combines comedy, music, dance, and burlesque to create an offbeat type of live entertainment. Female impersonation quickly became a facet of the vaudevillian entertainment experience. It was through vaudeville that the first official well-known drag queen came to exist, named Julian Eltinge. His popularity moved beyond vaudeville and his success earned him the title of being the highest paid actor in the world — surpassing even Charlie Chaplain at the time. Female impersonation and the history of drag is said to have entwined with gay culture around the 1930s. When the United States entered the Prohibition era, which abolished alcohol production and consumption from 1920 until 1933, gay men used the underground clubs and speakeasies as an opportunity to express and enjoy themselves. 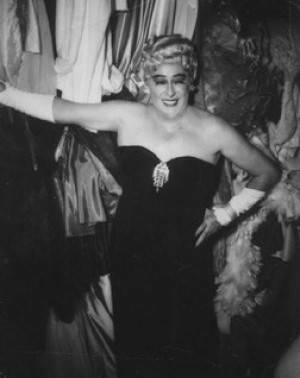 Public Romain ReviewRae Bourbon, a popular drag performer of the “Pansy Craze” era. Out of the sight of the law, gay men felt free to be themselves in the underground Prohibition scene and felt free to dress as drag queens as well. The increasing popularity of speakeasies where drag was welcomed during Prohibition became known as “the Pansy Craze.” But even long after Prohibition ended, the gay bars that featured drag during this time continued to operate well into the 1950s and 60s. Meanwhile, broader culture continued to criminalize gay culture and police cracked down on those gay bars. In response, the drag scene moved in a sense underground. The gay community continued to flourish despite the fact that it was illegal for them to be served alcohol in bars, or even to dance together. The State Liquor Authority and the New York Police Department regularly raided bars that catered to gay patrons. Oddly enough, it would be the New York mafia, and the Genovese family in particular, who would covertly give the drag queens and gay community an outlet. In 1966, a member of the Genovese crime family purchased the Stonewall in Manhattan’s Greenwich Village which would then become a hub of gay culture and the epicenter of a series of riots in 1969 which resulted in galvanizing the gay community against their oppressors. At the forefront of this movement, drag queen Flawless Sabrina organized multiple pageants across the United States which showcased drag queens much like a traditional beauty pageant. 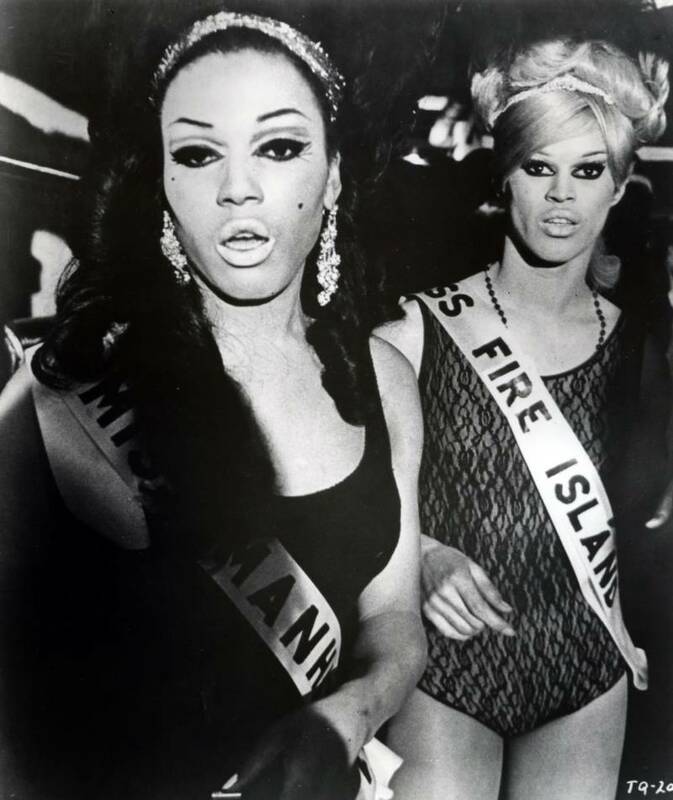 Grove Press/PhotofestDrag queen Crystal Labeija competing in a drag beauty pageant in the late 1960s. She was arrested many a time and appeared in drag in public, including while being a guest on talk shows, which was unheard of at the time. LGBTQ members of color simultaneously fostered their own havens in uptown Manhattan, in neighborhoods like Harlem and Washington Heights. It was here where the drag “ball” culture is believed to have originated in the early 1970s. It was then that drag culture seemed to slowly fold into mainstream society with such drag and gender-bending performances by actor Tim Curry in 1975’s Rocky Horror Picture Show and the aesthetic stylings of musician David Bowie. Francois LE DIASCORN/Gamma-Rapho via Getty ImagesDrag queen Divine performing in New York in the 1970s. The 1980s saw even greater experimentation with drag and gender-bending in music and film through artists such as Boy George and Pete Burns. By the 1990s, the world was ready to make the drag queen more mainstream than ever before. Indeed, the drag queen at the helm of this acceptance was none other than RuPaul Charles who would change the history of drag in the modern age. RuPaul made a name for himself in the late 80s and early 90s in the New York City club scene. He became a local celebrity who laid the foundation for him to achieve nationwide success. That success came in the form of his hit 1993 single “Supermodel (You Better Work).” The song catapulted RuPaul, who soon after became the first drag queen to ever become a spokesperson for a major cosmetics company with MAC Cosmetics, got his own talk show on VH1, and a morning radio show on WKTU. Catherine McGann/Getty ImagesRuPaul Charles poses for a group portrait in November 1992 in Times Square, New York City. In 2009, RuPaul premiered his reality competition series RuPaul’s Drag Race. The show has since become a popular phenomenon. In the modern era, where the internet can bring marginalized communities into the spotlight, drag has found a fan base that’s become larger than life. The drag queen has entered the mainstream once again — and this time, it seems like it’s here to stay. After this look at the history of drag queens, take a look at the most famous drag queens of the 20th century. Then, learn more about the Stonewall riotsand how the events impacted the landscape of gay rights in America.